Norman Osborn as a villain is, if nothing else, persistent. After his quasi-lighthearted appearance in Spider-Man's Tangled Web #13, Norman returned to meddling in the life of Peter Parker. A Death in the Family is a four part story that appeared in Peter Parker Spider-Man V2 #44-47 and featured another intense clash between Spider-Man and the Green Goblin. But this time, the Goblin's intentions are not what they seem. 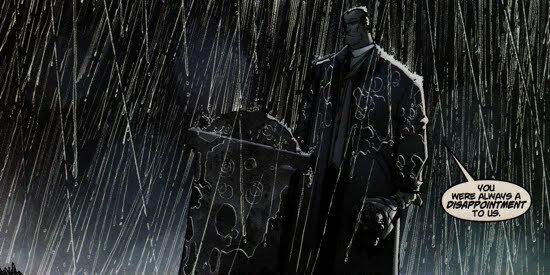 In Peter Parker Spider-Man V2 #44, Norman Osborn visits the grave of his deceased son Harry. Norman recounts his latest battle with Spider-Man and warns Harry that he can't "let it stand at that". Norman then points out how similar Harry and his mother (Emily) were, and despite that he still 'tried to be fair' to his son. He then suggests that he died of a drug overdose 'just to spite him'. Interestingly, Norman says that Harry was 'always a disappointment to us'. Since Emily died when Harry was very young, one could assume that Norman is not referring to her as a part of 'us'. Could it be that he is referring to both himself and the Green Goblin as two separate entities? Possibly. Eventually, Norman leaves the flowers he brought and informs his son that he will not be back to see him again after "what happens next." Meanwhile, Peter is also going through his own personal troubles as he deals with the stress of a painful recurring dream. After he arrives at his Aunt May's home he confides to her that he is unable to reach the person whom he feels would understand his burden. The story then shifts back to Osborn, implying that he is that person who 'would understand' Peter's pain. Osborn, who is garbed as the Green Goblin minus the mask, is in his executive office seemingly reaching out for Peter as well. Later, while Peter is out as Spider-Man, he is approached by the Green Goblin who catches the web-slinger off guard. The Goblin tells Peter that he wants to "renew their acquaintance" and a fight ensues. Each combatant enjoys the upper hand for a short time, as Peter insists on speaking to Norman and not the Goblin. Peter soon realizes that the Goblin cannot force him (Peter) to do what he does not choose to do. To which the Goblin responds, "Five bucks and a pizza says I can". As the Goblin leaves on his glider, he tells Peter that this was just a warning and that Peter is invited to an Osborn family reunion that will feature a funeral! The story arc continues in Peter Parker Spider-Man V2 #45 where Norman's diabolical plan commences. The Green Goblin releases a video tape claiming his innocence in the death of Gwen Stacy. The Goblin claims that he had planned to catch the falling victim, but that Spider-Man intervened to hastily and caused her untimely death by snapping her neck when he caught her with his web-line. The Goblin's tapes were released to the public and various media outlets picked it up, including Larry King Live. However, it did not appear as though many people believed the Goblin's claims. Soon after, Norman tracks down Flash Thompson and offers him a job, as phase two of his attack on Parker begins. 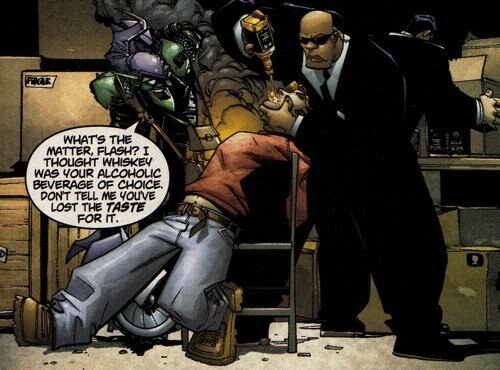 Flash, who was struggling to conquer his alcohol addiction, accepts Norman's offer. 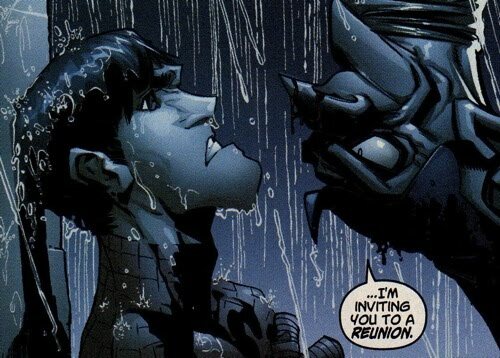 Later, Peter crashes a dinner party held by Osborn and his guests, employees the Tanaka Corporation. While Norman is toasting the newly forged merger between Osborn Industries and the Tanaka Corporation (hey! Maybe that's where the name Oscorp came from?! ), Peter demands Osborn's attention for the release of those tapes. The two then speak privately and Norman tells Peter that "one of us is going to have to die". Later, the Green Goblin and his henchmen force-feed Flash whiskey and put him behind the wheel of an Osborn Industries truck. The intoxicated Thompson than crashes the tanker into Midtown High. Fortunately nobody was killed (except Peter's class pet the hamster). Flash was not as lucky, he suffers permanent and irreversible brain damage. Peter's situation goes from bad to worse when he receives a package from Norman that contains pictures of Peter's loved ones, an obvious threat in Peter Parker Spider-Man V2 #46. Soon after, Norman makes a trip to Midtown High as a means of quelling the anger at Osborn Industries for the recent tragedy at the school. He offers his sincerest apologies as well as a blank check for the damage. 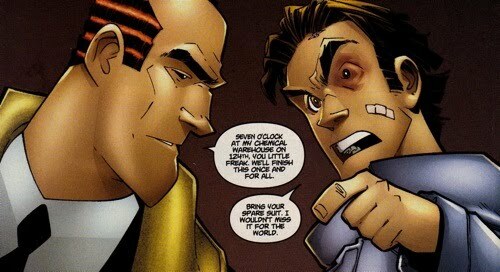 Peter confronts Osborn and his phoney remorse, and the two privately agree to battle it out one last time (yeah right!) at Osborn's chemical warehouse. 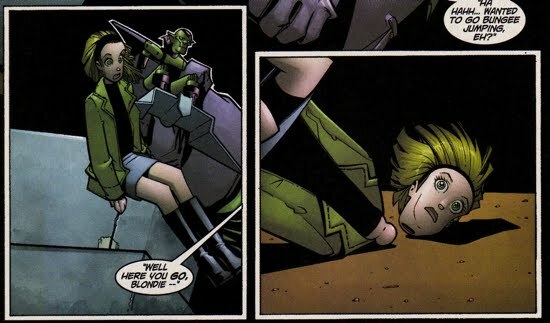 When Peter arrives at the warehouse, he finds the villain dressed as the Green Goblin playing with action figures and reenacting the death of Gwen Stacy. At the warehouse, the two combatants waste no time to start their slugfest. In the melee that ensues, Norman tells Peter that he plans on killing his own grandson, Normie Osborn, because he is too much like his father and he doesn't want him "weaseling his way in on all the loot when [Norman's] gone." Peter vows to stop that from happening. The fourth and final chapter of the A Death in the Family story arc is featured in Peter Parker Spider-Man V2 #47. The story continues immediately following the events of the previous issue, as Norman torments Peter relentlessly. He informs Peter that he is one phone call away from killing every person close to him, using operatives that are stationed all over the world waiting to carry out his orders. As Norman pushes Peter's buttons, Peter starts to become more and more aggressive. The Goblin explains further that only one of them would leave the warehouse. Norman adds that in order for Peter's loved ones to survive, Peter must kill him (Norman). Just when it appears that the Goblin has Peter finished off, a new burst of energy frees Peter from the Goblin's grip. Inspired by those close to him that he had lost, Peter begins pummeling the Goblin. Spidey's offensive sends Osborn into retreat. The Goblin eventually tries to escape, but Peter shoots a web-line and pulls him off of his glider. 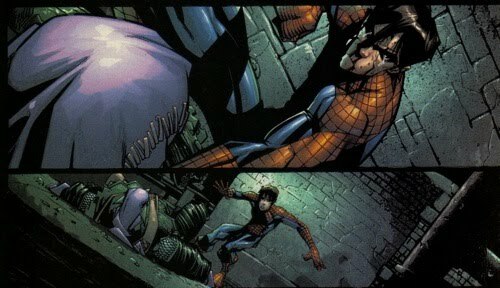 As Peter gets ready to deliver the death blow, he's actually encouraged by Norman to do so, this causes Peter to cease. 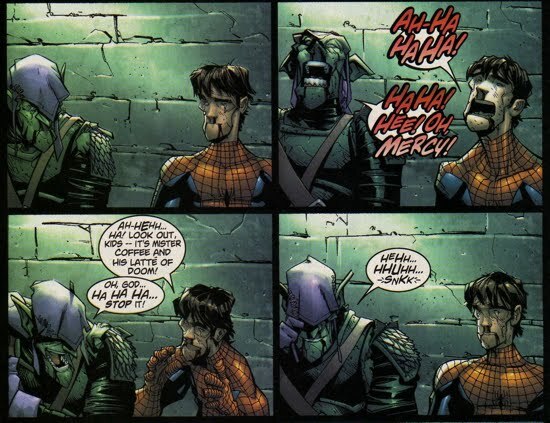 Spidey then releases Osborn and backs away after he realizes the Goblin's true intentions. Norman Osborn wanted Peter to murder him, to put an end to his misery. The two then sit down beside each other. After they share a laugh, Peter tells Norman about his recurring dream. In his dream there is an imminent plane crash and Peter is convinced that Mary Jane is onboard the plane. When he eventually digs through the wreckage he doesn't find MJ, rather Gwen Stacy. Peter explains to Norman that he thinks Norman wouldn't have killed Gwen had he gotten to know her (but what about Sins Past?). Peter goes on to say that not a day goes by in which he doesn't think about killing Osborn for what he did to her. However, Peter realizes that every day in which he refuses to hate him (Norman), Gwen lives; and that if he caves into his anger then she would truly die for good. Peter soon becomes convinced that this logic is the reason for the recurring dream, forcing him to keep his anger toward Osborn in check. Peter then calls Osborn's bluff about killing his own grandson and parts with the words, "I won't have to send you to jail…just being you—that's life without parole." Norman is later seen in his executive office with a note and a gift from Peter Parker, $5 and pizza. Norman angrily smashes the food against the wall and soon reaches for the top drawer of his desk, which contains a hand gun. Norman is contemplating suicide. Recent retcons have added new context to some of the events from A Death in the Family. First, Norman's visit to Harry's grave has a whole new meaning since we know that Norman was aware that Harry never died (as per Brand New Day). Also, Peter laments that Norman could have benefitted by having a relationship with Gwen and that she could have been able to 'fix' him. Sins Past pretty much sums up why Peter was incorrect with that thought process and that Gwen certainly failed to 'fix' Norman.